After a brief meeting in the morning over breakfast, we departed our hotel. I dropped in on my way back home to a port nearby because I knew that it had been historically important place. 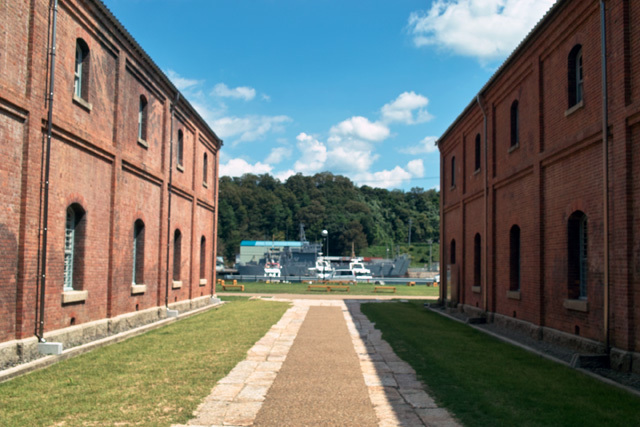 There had been a base for the Navy until the end of WW-II. 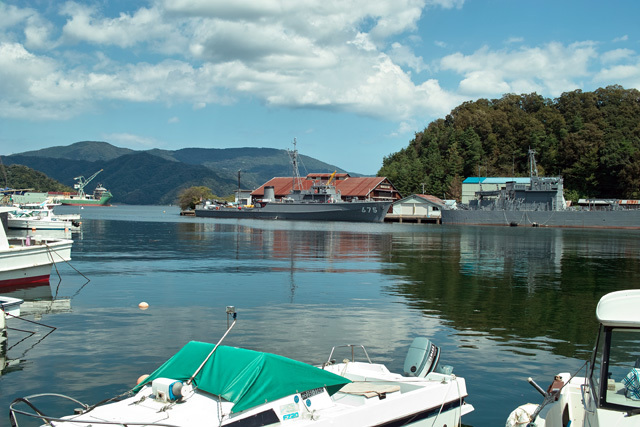 I had no idea how the place looked like and was partly surprised when I spotted a number of military (more precisely, the self-defense force) ships in the port. There were however few items in the museum which reminded us of the past. I was bewildered slightly. A dance workshop was started around 2 in the afternoon. Mr. Jareo, the dancer, instructed us to make a contact with a stone, hitting around on the ground responding to a phrase, and some other exercises, all of which puzzled but made us to think of our own. The workshop proceeded as usual anyway. Then, the teleoind was presented to the participants, two of them were more or less cognitively impaired. 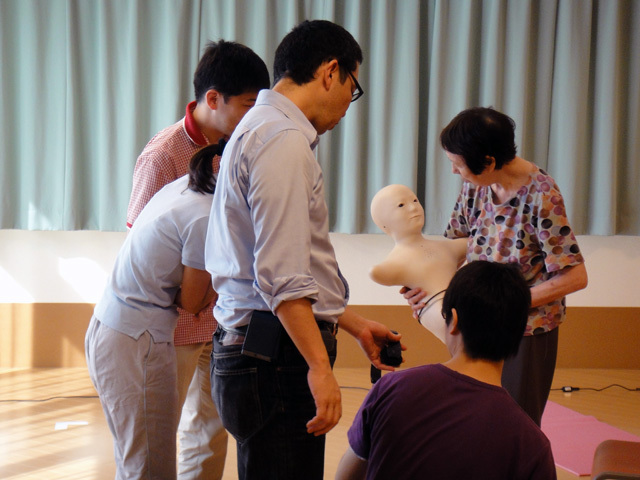 I was amazed to see they liked the humanoid. I had never seen her talking to someone (or something) so seriously. In a sense, the humanoid elicited more reactions of those people than people like us would do. Everything has a place where it functions best. That was the lesson I learnt of my experience on that day. I drove to Maizuru, a small city 230km away from home. The driving was more or less boring as the half of the route was already familiar to me and the latter half was all through mountains and hills. I had to drive myself because I needed to take machines, devices, cables, etc. The destination was a care institution called Gracewill Maizuru. One of our colleagues had been actively involved in the education system and some other activities including the dance performance, anthropology cafe, and so on. With the close relationship with the institution, we intended further to extend our activity to an experimental level. 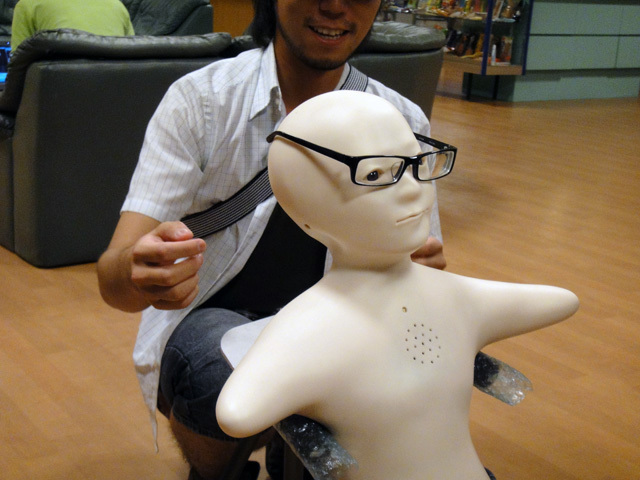 We were going to bring in a small humanoid called telenoid, which was supposed to convey a sense of existence to the user. 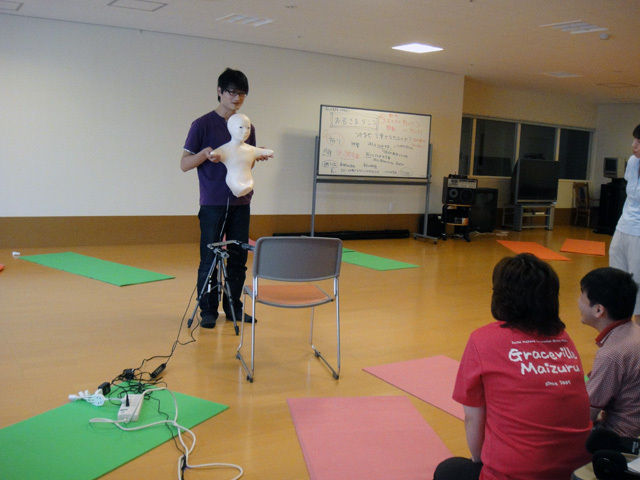 They key concept is the bodily communication, for which I had took part in the project. I thus took a motion capture system to the place. It only took an hour to set up the machinery, which was a relief. I was certain that the person who took care of us was puzzled seeing me placing those funny objects on the flour. More puzzlement was however to come later when another guy brought in the humanoid to the institution. We took part in the anthropology cafe, where we heard of a travel by our colleagues, who had been to Okinawa, the border islands in the south of Japan. The talk lasted about an hour and half. Then came in the telenoid. I was curious to see how they would react to it, but to my surprise, it was welcomed by most of the participants. I am not sure whey it was the case, but it was not bad at all. 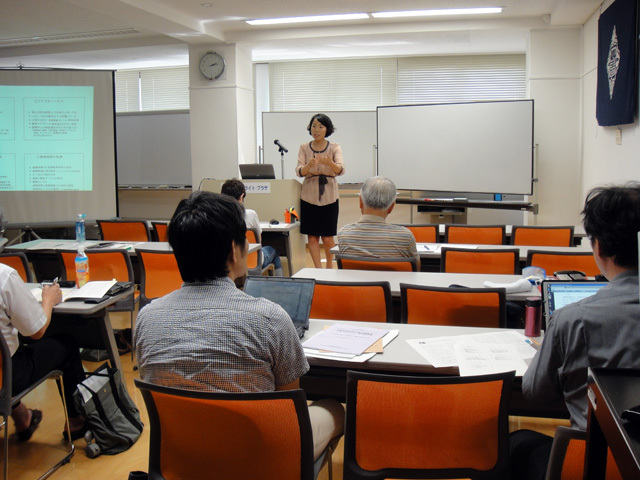 We held the second meeting for the special interest group of social welfare and information and communication technology in Kanazawa. We are interested in the interaction between social welfare and technology, more specifically, how ICT may contribute to improving the quality of life for the people with dementia. The first meeting was held a month ago, where we studied how the social welfare system is managed for caring the elderly and how those people feel as cared that way. The next meeting on this day was held to study the situation in Korea, our neighbor. I learnt for the first time that the country investigated the scheme of Japan carefully in establishing theirs. They seem to have time until the number of the elderly reaches to the critical level, but it is a concern that the speed of aging is so fast, the fastest in the world. Another lecturer reported us of the investigation she had undertaken to see how ICT is used in institutions. It turned out that people in Korea are relying on the technology, probably more than we Japanese are. One of the causes is the conflict between caregivers and the family members whose parents are cared by those workers. The caregivers are vulnerable to the claims made by those family members and need a way to protect themselves from groundless claims. We had examined the possibility a while ago, but believed it not to become an issue in Japan. I was a bit surprised to see the fear had a ground at least for our neighbor. I am going to a care institution next week to collect data of careworkers. 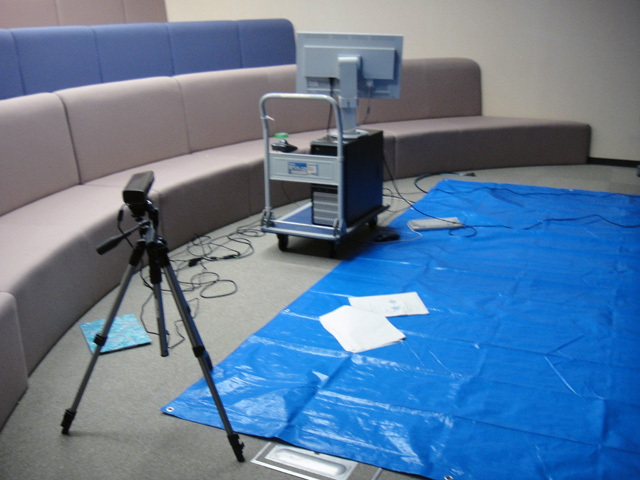 We plan to collect motion data of them to see how they communicate with people with dementia. That is a goal and we obviously need to do lots of things till we reach the core. I checked if the motion capture system, which I bought recently, works properly. It seems to be working. There were some tricky things, but I figured it out how to deal with them. The development of the motion capture technology is amazing. I could not imagine this level of device would become available so cheaply. Thank you, Microsoft, for their wonderful device, Kinnect. 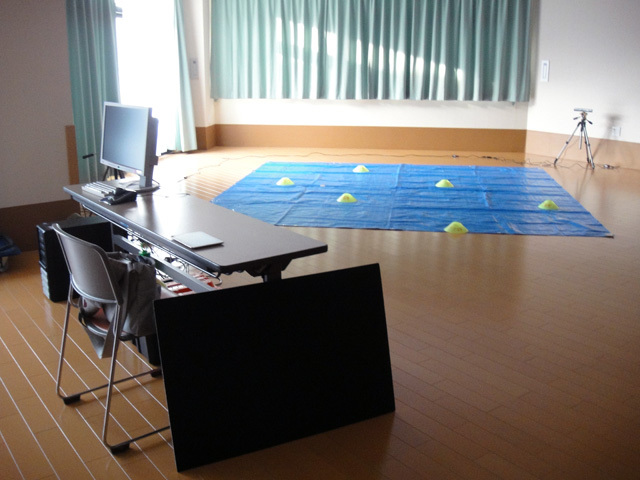 The motion capture system requires a large space.